Since November 26th, 2007, Iowa Senator Chuck Grassley has unleashed 1830 tweets worth of frequently incomprehensible, crazy/beautiful Twitterness. Are his tweets 140-character poetry, a Joycean prank, or merely the handiwork of aging fingers on a touchscreen? In an interview with BLT, Senator Grassley explains all—sort of. 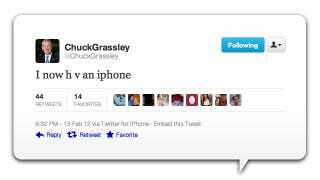 So what do we learn about Sen. Grassley's tweets? Well, like all smart people these days, he abandoned his Blackberry for an iPhone—an event he announced in trademark-style on Twitter. But what the Republican Senator loves the most about Twitter is the opportunity to communicate directly with his constituents without a filter. He represents the people of Iowa, after all, and they have the right to know what he's up to. On Twitter there's no pesky media to take your quotes out of context, and no officious press secretaries or irritating assistants to make sure you've spelled every word in your tweet correctly. Unfortunately, as BLT's Todd Ruger learned, it's this lack of a filter that gets Grassley in trouble. @toddruger: Your tweets draw attention/criticism, often because they sometimes have random punctuation or capital letters. What is the story behind why you leave those in there? Do you pay attention to anyone's reaction to your tweets? @chuckgrassley: I think there are a couple of factors involved. I suppose a lot has to do with the automatic correcting done by my iPhone. Second, I love Tweeting, but I don't like to type. So, I probably type and hit send a little too quickly.